You need a great photo, the kind of picture that grasps you by the collar and pulls you in - close. You want that one-in-a-million shot that says WOW without making a single sound. For more than 10 years, Juan Vasquez Photography has been providing inspired photos to the Greater Miami business community. Product shots, industrial pictures, corporate portraits, even dramatic fashion photography - we do it all. The best photos don't just happen. They're produced. It all begins with an understanding of your needs. We ask questions. And we listen to the answers. We want to understand how the photo will be used and who you're targeting. Knowing your goal is key to developing an effective concept. Go ahead. Throw us a creative challenge. We enjoy coming up with a fresh approach to the same old, a new slant on a familiar favorite. And our resourcefulness means we'll find a way to achieve your objective within your budget and time frame. At Juan Vasquez Photography, we admit we're a bit over-zealous about taking pictures. We love what we do. And it shows. To take a great photo, you must consider every variable - the lighting, the shadows, the subject, the background, the angle. Our fascination with details means we get it right the first time. Work with us, and you'll quickly see that "good enough" is not in our vocabulary. We are passionate about getting that perfect shot. While the most important factor in creating a quality photo is the talent behind the camera, superior gear is also a necessity. We use state-of-the-art digital camera equipment, giving us broad capabilities. We can even create high-resolution 16-bit TIFF files, suitable for large posters, outdoor billboards, two-page tabloid size magazine spread ads and vehicle wrap-around ads. Our post-production services include image compositing, digital enhancement, retouching, background removal, clipping paths and color correction. We have a world-class, 2,000 square foot cyclorama studio in Miami that gives us tremendous versatility. We also, however, welcome the challenge of location shoots. With South Florida as a backdrop, the opportunities are endless. Over the past decade, Juan Vasquez Photography has created memorable images for corporate, advertising and editorial clients throughout Florida and the U.S.
Let us show you what we can do. 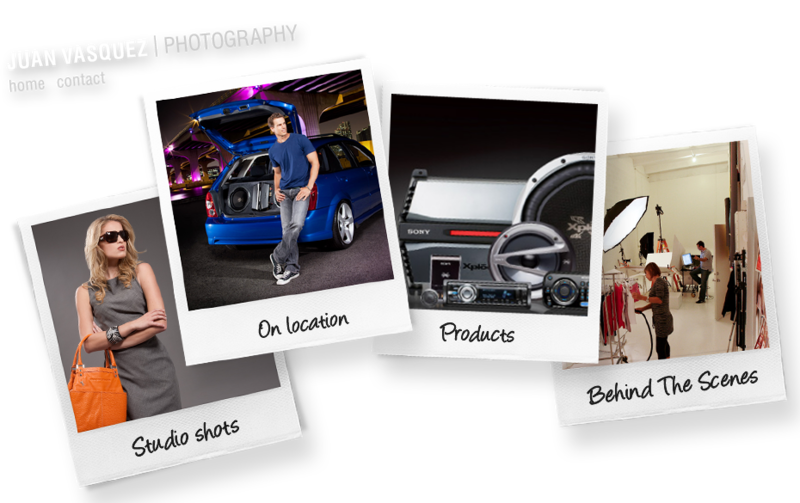 Get in touch with us today at our Miami studio to discuss your photography project. Our next winning shot could be yours! COPYRIGHT WARNING: The content in this website including photos, images, text, html, and designs is registered by JuanVasquez.com / WG Studios and protected by the US Copyright Office and international copyright laws. You may not copy, reproduce, download, store, post, broadcast, transmit, modify, sell or make available to the public content from this website without the prior written approval of WG Studios. WG Studios vigorously pursues any violation of copyright, site owners are responsible for infringements even if content is provided by an agency or web designer. JuanVasquez.com / WG Studios uses copyright automated infringement detection tools to search for unauthorized text and images used on other sites, our partners on content identification and tracking technology are TinEye, PixID, Copyscape and Glat Plagiarism Services Inc.